I am a renter. This is common knowledge if you've read my blog for any length of time. We live in a three bedroom townhouse. With four children, let's just say it's quite "cozy". So this is the year that we are going to make a change. In fact, we're planning on building a new home (more on that later, so stay tuned). Helping people design their new homes is what I do for a living. I LOVE it! It's so fun to take a blank canvas and create a beautiful home. It's exciting to pick cabinets, flooring, paint colors. All those choices that together make a space what it is. Here's the only problem with being an interior designer for a home builder, and building a home myself. I see too much. I fall in love with too many options. And another thing you have probably noticed if you've read my blog for any length of time is that I'm a bit fickle when it comes to decor. I have a *teensy* problem with liking to change things out. So narrowing down my own choices for finishes is a bit challenging. And that's putting it mildly. 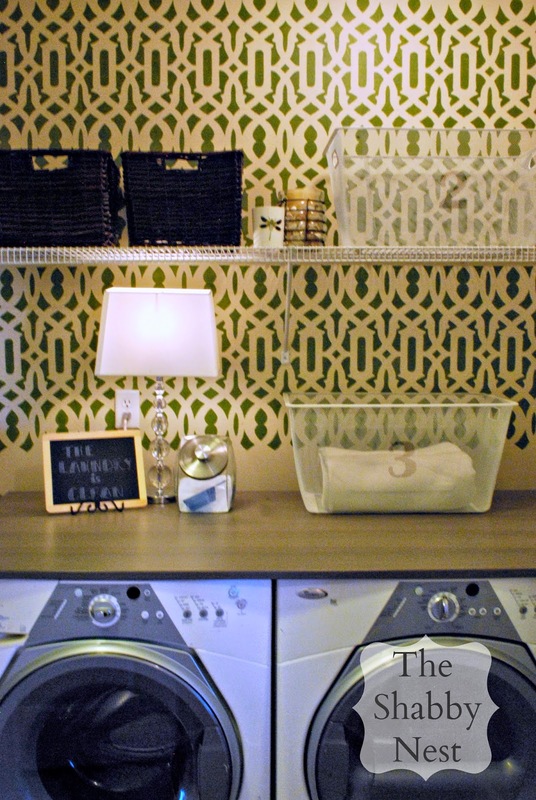 One of the things I'm most excited about is the fact that I can have a real live laundry room. That might sound funny, but I've been living with this laundry closet for the past three years. It's cute and colorful, but my love of its bright color and bold pattern is waning. And my laundry was in the basement for the two years before that...and in my half bath for two years before that. Again - a cute space - but "hello!" it was the guest bathroom. So let's just say I am crazy excited at the prospect of having an actual room. 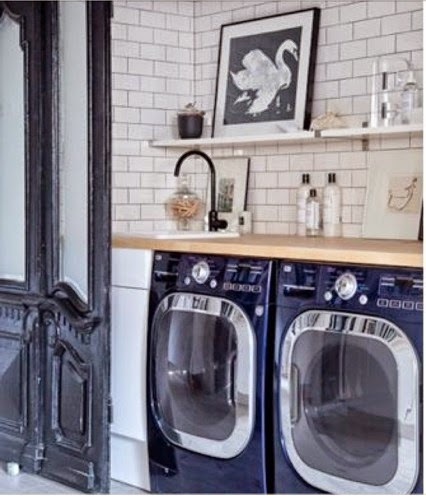 And because of that I've been looking at pretty laundry rooms for inspiration. Here is my current fave. Found on Pinterest (and unfortunately not linked to the actual source. sigh.) But I am in complete and utter L.O.V.E. with this space. Everything from the subway tile, to the black appliances and real, live artwork make me swoon. I adore the idea of a back splash in a laundry room and subway tile makes my heart go pit-a-pat. Pretty, but, unless you are ruthlessly tidy, I would choose cabinets rather than open shelving. I have shelving and as the kids get older and more things, larger things and more complicated stains and fabrics need to be treated, washed, dried and ironed, it's a challenge.